Like Ryan Murphy and Brad Falchuk’s previous American Horror Story incarnations, Freak Show (2014) is keenly aware of its precursors. Wednesday’s premier had numerous allusions to the predecessors that inform both the show and what makes freak shows and carnivals so terrifying, calling on established tropes while subverting others. 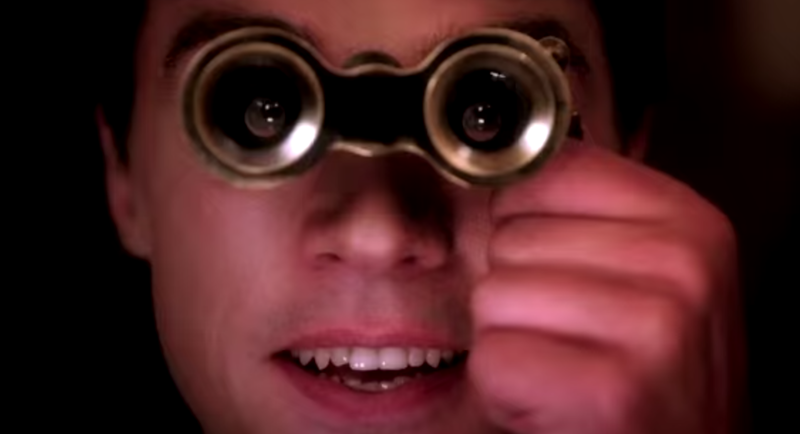 The season premiere of Freak Show is full of metareferences to both the history of sideshows and the media’s representation of freaks, small homages and nods that could deepen your interest or appreciation for season four. Freak Show is set in Jupiter, Florida, 1952, a time in American history when freak shows had fallen out of favor with the general public and existed mainly on the fringes, in isolated, marginalized communities like Coney Island. The freak show’s golden era lasted from roughly 1870 to 1920; dime museums, circuses, fairs and carnivals each featured their own collection of oddities and were the primary source of popular entertainment in the United States, particularly amongst rural populations (Bogdan 1990). P.T. 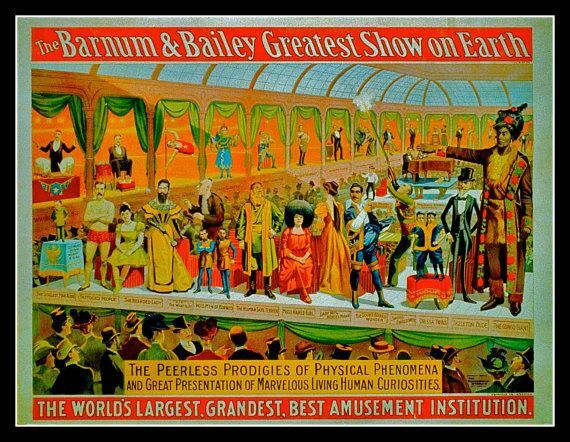 Barnum was amongst the first showmen to capitalize off of the interest in unusual, aberrant or deformed bodies, collecting an assortment of freak performers as a part of his traveling circus. These sideshows and carnivals were actually forerunners to the modern museum. During the late 1800’s and early 1900’s, freak shows were seen as culturally edifying, and it was not uncommon for visitors to collect freak photography (Bogdan 1990; Fordham 2007). Many circuses and sideshows employed “freak finders,” individuals who would scour the country for individuals who were either born different or could be constructed into a freak. Clyde Ingalls, manager of the Ringling Brothers, Barnum and Bailey Sideshow in the 1930s and one of the progenitors of the freak show, once said, “Aside from such unusual attractions as the famous three-legged man, and the Siamese twin combinations, freaks are what you make them. Take any peculiar looking person, whose familiarity to those around him makes for acceptance, play up that peculiarity and add a good spiel and you have a great attraction’” (Bogdan 1990:95), illustrating the notion that freaks were “made” rather than born, a performance and aesthetic fabrication as well as a social status. While the term freak is inherently problematic and morally complicated, I am using it to refer to the categorization of an individual who deviated from the established cultural “norms”. Freaks could be different due to physical traits, as well as personal characteristics. As the 20th century progressed, however, the rhetoric and popularity underlying the freak show as a medium of entertainment began to crumble. Biomedicine assumed an increasingly dominant role in cultural conceptions of the body, and deformity came to be understood as the purview of science and medicine, rather than something that should be paraded around for people’s entertainment. Rachel Adams writes, “As physical disability became the province of medical pathology, bodies once described as wonders of nature were reconceived in terms of disease […] Freak shows were sleazy arenas of exploitation and bad taste, relegated to small towns and bad neighborhoods where they would be patronized by audiences only slightly less marginal than the carnies themselves” (2001:57). Brigham A. Fordham adds, “Early in the twentieth century, a number of states and municipalities began to view freak shows as a threat to the morals of society and passed laws prohibiting or regulating freak shows. Fascination with the unusual body became more tainted with pity and disgust, causing the freak show to lose social status and popularity in the American psyche. By the 1940s, the heyday of the freak show had passed” (2007:3). The time period during which Freak Show is set is therefore telling—freak shows had become morally bankrupt and elicited fear and shame in spectators, rather than the huge audiences they used to drum up at the beginning of the century. Situating the show in Florida is also significant, as Gibsonton, Florida is a well-established a safe haven for freaks and carnies. Chris Balogh writes, “Gibsonton has long been a winter home to all the freak-show acts and show people. It was chosen for its proximity to the headquarters of Ringling Bros. in Tampa” (2013). Over the years, Gibsonton has been home to famous freaks such as Al “the Giant” Tomiani, Jeanie “the Half-Woman” and Grady Stiles “The Lobster Boy.” Elsa Mars’s desperation to increase the popularity of her freak show and the general disgust with which many of the characters on the show are met can therefore be understood within the historical milieu in which the show is set. 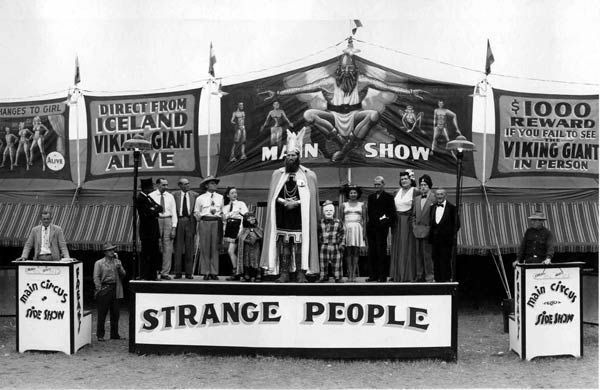 Many of the characters featured on Freak Show are recognizable “types” within the freak show circuit. Elsa’s “Cabinet of Curiosity” is doubtless a reference to the 1920 silent film The Cabinet of Dr. Caligari, set within a carnival in a remote German village, where a somnambulist is set upon a murderous quest. Cabinets of curiosity, or wunderkammer, contained exotic objects and strange artifacts from around the world displayed at traveling circuses and sideshows. 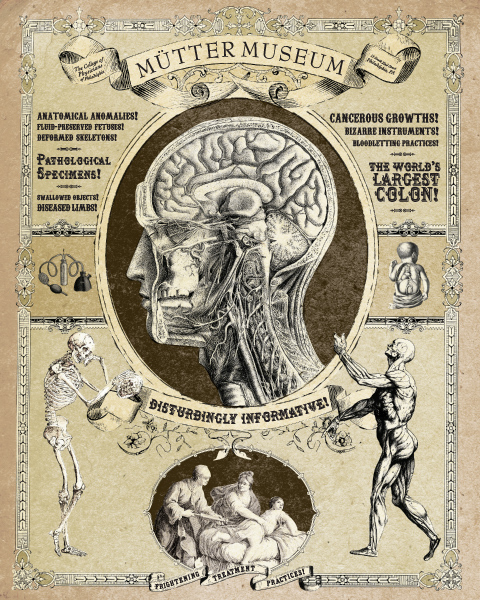 These wunderkammer can be seen as the precursors to modern day museums. The freaks Elsa includes in her show have historical, as well as cinematic and literary precedents. 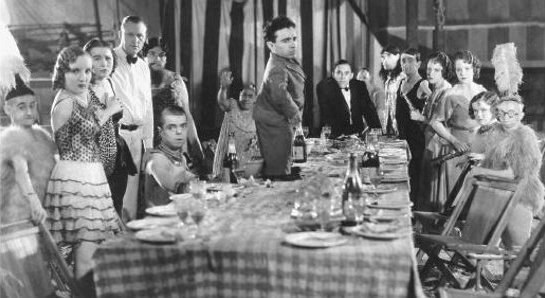 Many of the characters included in Freak Show are new formations of the famous carnies included in Tod Browning’s cult classic Freaks (1932). 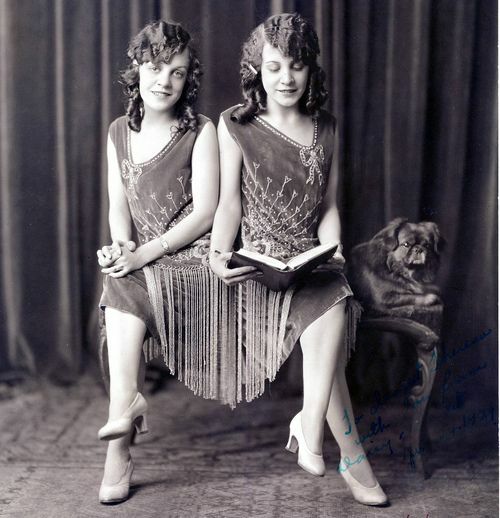 Conjoined twins were common attractions at freak shows, and Sarah Paulson’s Dot and Bette Tattler could have been based on Daisy and Violet Hilton, conjoined twins made famous on the vaudeville circuit throughout the 1930’s. Talented musicians, the two women were seen as charming entertainers and were among the cast of real-life freaks included in Freaks (1932). Bearded women, like Kathy Bates’s character Ethel Darling, were also fairly common in freak shows. Jane Barnell, otherwise known as Lady Olga, was a Bearded Woman that toured with Ringling Circus for many years, as well as starred in Tod Browning’s Freaks. 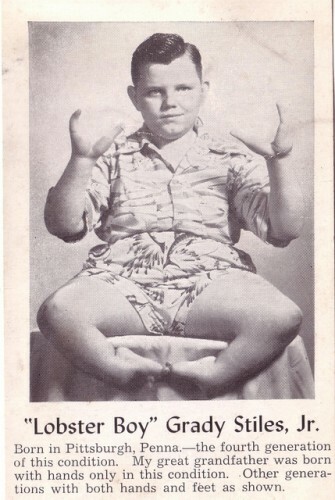 Ethel Darling’s son Jimmy Darling, otherwise known as “Lobster Boy,” could also be based off of Grady Stiles Jr. who also went by Lobster Boy due to his condition of ectrodactyly. Stiles’s family had a history of ectrodactyly, and Stiles Jr. performed in sideshows for many years before moving to Gibsonton. Mat Fraser, who plays “Paul the Illustrated Seal,” represents both the natural and fabricated forms of enfreakment within the sideshow circuit. Fraser possesses phocomelia in both arms, which led to his stage name “Seal Boy.” In behind the scenes interviews for the show, Fraser reveals that his condition was caused by his mother’s use of thalidomide during her pregnancy (Duca 2014). Thalidomide was a drug used to treat morning sickness in pregnant women in the 1950’s and 1960’s, and ultimately led to severe physical disabilities and sterility in countless children (Winerip 2013). Similarly, in Katherine Dunn’s cult classic Geek Love (1989), Al and Lil Binewski experiment with eugenic testing and materials known to induce deformity during pregnancy to knowingly reproduce “freak” children, the oldest of whom is Arturo, a boy with flippers for hands and feet. Fraser’s tattoos were also considered freakish during the golden age of freak shows. Tattooed men and women were members of the self-made freak collective, especially considering that, “naturalists and early anthropologists saw the practice of tattooing as the ultimate sign of primitiveness, revealing a lack of sensitivity to pain and unabashed paganism” (Bogdan 1990:241). A reincarnation of Koo Koo the Bird Girl, otherwise known as Minnie Woolsey, can be seen amongst Freak Show’s cohort, another reference to Tod Browning’s Freaks. Naomi Grossman reprises her role of Pepper from Asylum (2012-2013) for Freak Show, a so-called pinhead with microcephaly. Individuals with microcephaly were often included in freak shows as exotified “missing links.” Tom and Hettie, siblings born in Ohio with microcephaly, were billed as Hoomio and Iola, “The Wild Children of Australia” in P.T. Barnum’s Circus (Bogdan 1990). Schlitzie, a sideshow performer in several circuses and an actor in Freaks, was perhaps one of the most famous “pinheads” and doubtless an influence in the character of Pepper. The most terrifying character in the premier of Freak Show was John Carroll Lynch’s Twisty the Clown. As Murphy and Falchuk are well aware, clowns are prominent nightmarish figures in the American cultural imagination, from Stephen King’s It (1986) to John Wayne Gacy, the serial killer who made a living as Pogo the Clown. Prior to his role on Freak Show, Lynch also played the villain on another freak show series, HBO’s Carnivale, which ran from 2003 to 2005. A cult classic in its own right, Carnivale depicts the fantastical world of freak shows during the dustbowl Depression era. There are numerous other examples of carnivals used as terrifying, nightmarish spaces that seem to embody the phastasmagoric horror of Poe, such as Ray Bradbury’s Something Wicked This Way Comes (1962), in which the circus space transcends the boundaries between human and monster, reality and fantasy. 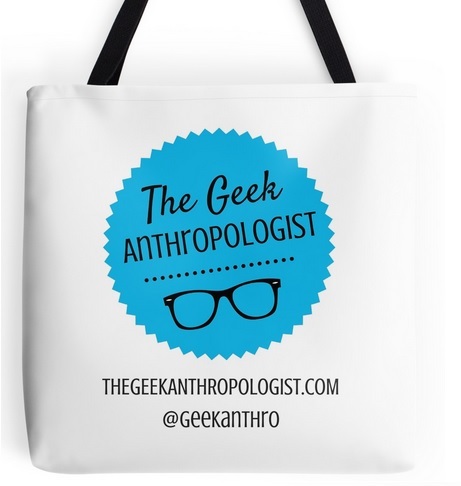 The carnivalesque “grotesque” can be understood as a liminal space that pushes the borders of normalcy to explore cultural conceptions of deviance. As a cultural space that exists on the margins of human society, carnivals are often seen as the terrifying interstices where established codes and truths become mutable, where magic and terror can become intertwined, presenting alternatives to social order and normalized versions of identity. They are seen as the spaces where dreams and reality intermingle, subverting established ideologies and perceptions of the world where the freakish body can ultimately be seen as transformative and destabilizing (Chemers 2003). Michel Bakhtin’s theories of the carnivalesque similarly portray the carnival as a liberatory, chaotic space, one that opens up new possibilities and beginnings, with destructive as well as regenerative qualities (1968). As Freak Show continues to explore the lives of Elsa’s Cabinet of Curiosities, the identity of the various characters, and their place within 1950’s American culture, we can think about the cultural and historical influences that inform the show. 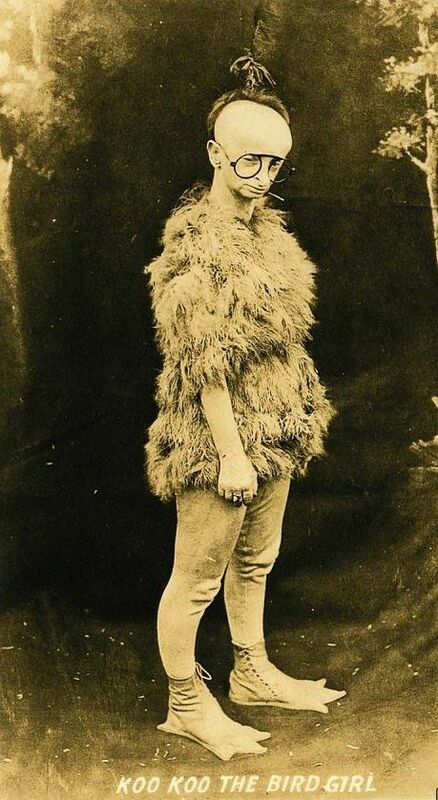 Although the history of freak shows is full of stigma and exploitation, many performers have also appropriated the label of freak and used freak shows as a platform for empowerment. The creators of American Horror Story want to recoup certain horror tropes and clichés, while reinventing the genre. They ask us to consider what we find most terrifying, question cultural perceptions that have become normalized, and interrogate what it means to be monstrous. Adams, Rachel (2001). Sideshow U.S.A.: Freaks and the American Cultural Imagination. Chicago: University of Chicago Press. Bakhtin, M.M. (1968). Rabelais and His World. Trans. Helene Iswolsky. Cambridge, Mass. : MIT Press. Bogdan, Robert (1990). Freak Show: Presenting Human Oddities for Amusement and Profit. Chicago: University of Chicago Press. Bradbury, Ray (1962). Something Wicked This Way Comes. New York: Harper Collins Publishers. Browning, Tod (1932). Freaks. MGM. Chemers, Michael M. & Jim Ferris (2008). Staging Stigma: A Critical Examination of the American Freak Show. Palgrave Macmillan. Dunn, Katherine (1989). Geek Love. New York: Vintage Books (Random House, Inc.). Fordham, Brigham A. (2007). “Dangerous Bodies: Freak Shows, Expression and Exploitation.” UCLA Entertainment Law Review. King, Stephen (1986). It. New York: Penguin Books. Knauf, Daniel (2003-2005). Carnivale. HBO. Murphy, Ryan & Brad Falchuk (2012-2013). American Horror Story: Asylum. FX. Murphy, Ryan & Brad Falchuk (2014). American Horror Story: Freak Show. FX. Wiene, Robert (1920). The Cabinet of Dr. Caligari. Little taken a back when i watched the first episode of freak show as i live in work in jupiter fl. Such a tiny town show cased. My analysis of the history behind American Horror Story, analyzing the rise and fall of freak shows throughout the United States. do not forget this website and give it a glance on a constant basis.